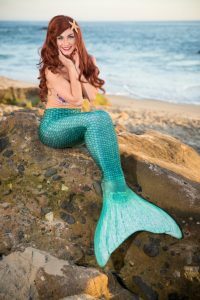 The princess you know and love, Mermaid Princess, has changed back to her under the sea ways and is swimming to a party near you. 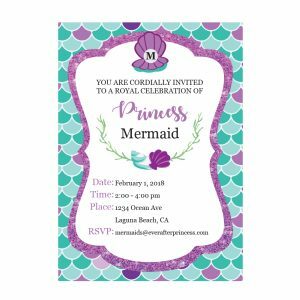 Still the bubby, inquisitive, excited, all things human-loving princess she now has slipped into her purple shell top and fins to sit poolside and entertain guests at your pool party, princess party, event or any combination of the three. 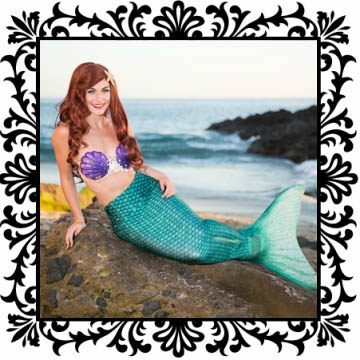 Our most popular choice for summer events, she is perfect not only for birthday parties, but summer get-togethers, country club and upscale hotel events for kids and adults. 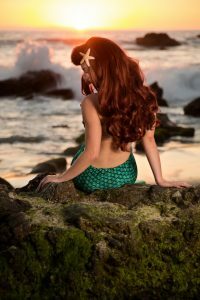 Swimming over to you in Orange County, Riverside County, San Diego County, Los Angeles County and of course a beach in your area. Please contact Ever After Princess office directly for inquiries regarding this premier princess and options for her events. Swimming mermaids come with various color tails and silicone and/or embellished suit top (not pictured). Red Wig not included for mermaids in water.